The Tire Mobility Kit is a temporary fix to the tire and we recommend that the tire inspected by an authorized Kia dealer as soon as possible. Have your tire repaired as soon as possible.The tire may lose air pressure at any time after inflating with the Tire Mobility Kit. - When replacing or repairing the tire after using tire sealant, make certain to remove the sealant attached to the inner part of the tire, including the tire air pressure detection sensor and wheel. If the sealant is not removed, noise and vibration may occur, and the tire air pressure detection sensor may be damaged. - We recommend use original Kia manufactured sealant. 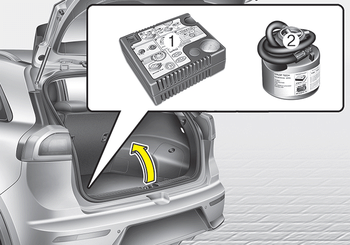 Using aftermarket sealant may damage the tire air pressure detection sensor. 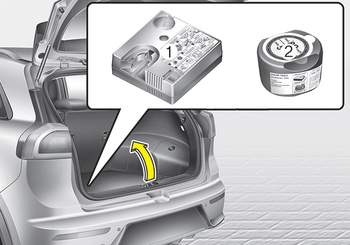 - If the TPMS warning light illuminates after using the TMK, we recommend that you contact an authorized Kia dealer.